Schleich Realistic Pentaceratops is museum quality replica, hand painted, authenticated model by the paleontologists of the Museum of Natural History. 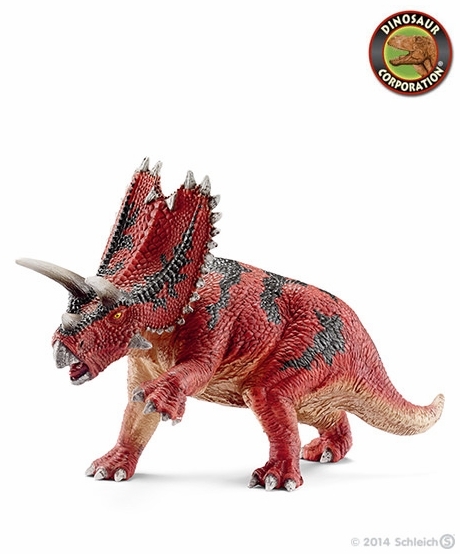 Pentaceratops is a great toy gift for dinosaur enthusiasts and serious collectors. Pentaceratops is a genus of herbivorous ceratopsid dinosaur from the late Cretaceous Period of what is now North America. They lived around 76-73 million years ago, its remains having been mostly found in the Kirtland Formation in the San Juan Basin in New Mexico. Measuring 7.5 meters in its length and standing 2.5 meters tall, the Pentaceratops was one of the largest ceratopsid dinosaurs. Unlike the more famous Triceratops, the Pentaceratops had a five-horned skull.